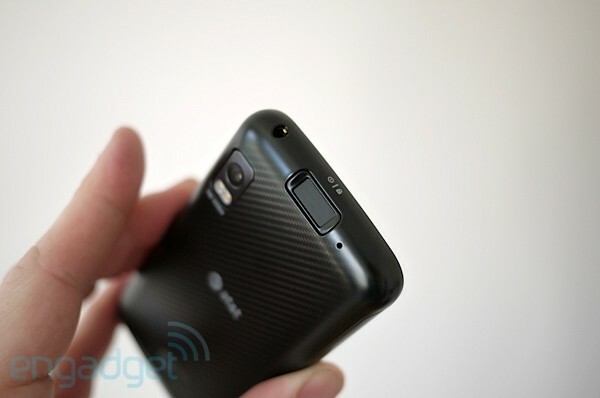 It's finally here -- our Atrix 4G review! We know you've waited and wondered, and we've finally had enough time with the phone, laptop dock, HD / desktop dock, and all the accessories to give you a proper take on this utterly unique smartphone. Did we say smartphone? Really that's not quite right, because the dual-core-CPU-sporting device actually does quadruple duty as a laptop, set top box, desktop computer, and... well, it works as a smartphone too. The Atrix 4G, which sports a 4-inch, 960 x 540 display, HSPA+ data, and a slew of other juicy specs is absolutely the first of its kind -- a multi-use device intended to replace your netbook (and maybe more) via its Webtop environment. But can a phone be powerful enough to become your laptop or hub of your home theater? 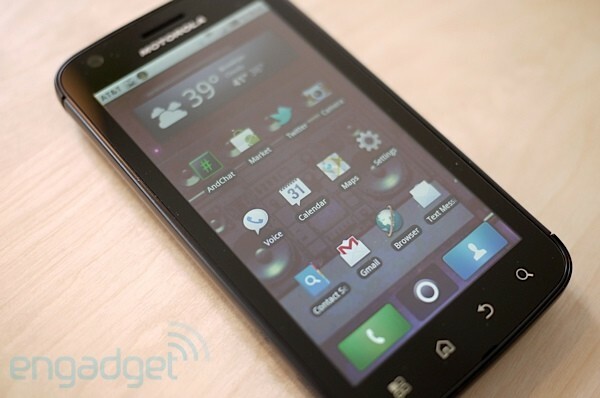 Is Motorola's new phone set to be the king of the Android heap, or just another face in the crowd? All these questions (and more) will be answered in our full review... which you can read after the break! The hardware of the Atrix 4G is notable for a number of reasons, not the least of which is design. The body of the phone is largely plastic, but don't let that bother you too much -- it's put together so solidly that it feels like a much pricier material. The handset measures 2.5 inches wide by 4.63 inches long, and just 0.43 inches thick, which means that the Atrix is nearly as thin as the iPhone 4 -- quite a feat considering how much horsepower is packed inside. The phone probably gains a little of its solidness via its weight, which clocks in at a not-feathery 135 grams (about 4.8 ounces) -- and we like that a lot. Like most slate phones, the front of the device is nearly all screen, save for the familiar Android buttons along the bottom, and the front-facing camera and earpiece up top. Along the top rear of the phone is a power / sleep button which just happens to be a fingerprint scanner too, and the 3.5mm headphone jack. Along the right side of the phone is the volume rocker (easily accessible with your thumb during calls if you're right handed). On the left side you'll find the Micro USB and HDMI ports. Around back, the stylishly patterned casing is broken by the 5 megapixel camera with LED flash, and a speaker along the bottom of the phone. As far as truly unique hardware goes, the fingerprint scanner seems fairly novel -- but in practice it's a little frustrating. It does work as advertised, but being told to re-swipe your finger if it doesn't take when you're trying to get into the phone quickly can be a little bothersome. Unless you really need the high security, a standard passcode will suffice for most people. Fingerprint scanner quibbles aside, the Atrix 4G is one of the better looking Android devices we've had a chance to use. We would have liked to see higher quality materials in play here, but despite the housing, the phone comes off as both sleek and rugged -- a great combo for something that will likely be doing double (if not triple) duty in your connected world. From an industrial design standpoint, this device more than holds its own against the the best of the best on the market right now. Of course, the Atrix 4G isn't really about looks -- it's about raw power. You know that Motorola isn't kidding around by packing this handset with a blazing 1GHz dual core CPU, 1GB of DDR2 RAM, 16GB of storage onboard (plus a microSD slot for another 32GB). Along with the massive internal horsepower, the device boasts a 960 x 540 capacitive touchscreen that Motorola is calling its qHD display -- which also happens to be covered with Corning's Gorilla Glass. You'll also find the requisite radios here -- WiFi 802.11b/g/n, Bluetooth 2.1+EDR, and of course that HSPA+ GSM number which allows AT&T to (somewhat liberally) call this phone a 4G device (more on that in a moment). The phone also has a light and proximity sensor, as well as a built in accelerometer and compass. To put it simply, this is one of the fastest (if not the fastest) Android phones we've ever used. Getting around the phone doing even complex tasks was insanely speedy, and we rarely if ever found ourselves waiting for something to load. Scrolling between homescreens or managing apps and widgets was silky smooth, and feels competitive with the likes of the iPhone 4 or EVO 4G. The phone absolutely blazes as a standalone handset, and we were consistently impressed with how deftly it was able to take on whatever we threw at it; even when playing new 3D game titles like Gun Bros, we didn't see a hint of lag. As far as the display goes, we're extremely excited to see new Android phones taking higher resolution screens. With the added real estate the qHD provides, we were able to get a lot more utility out of Gmail, the browser, and a handful of other content-heavy applications, and text and images looked crystal clear on the display. There were some issues with Android applications that don't properly take advantage of increased resolution, but they were few and far between -- for the vast majority of software we used, the display worked beautifully. Touch response was also excellent, though we can't say if that's due to the screen technology at play here, or that super fast CPU. One item of note -- the display is difficult to see in bright daylight, and the automatic brightness adjustment didn't quite do the trick. 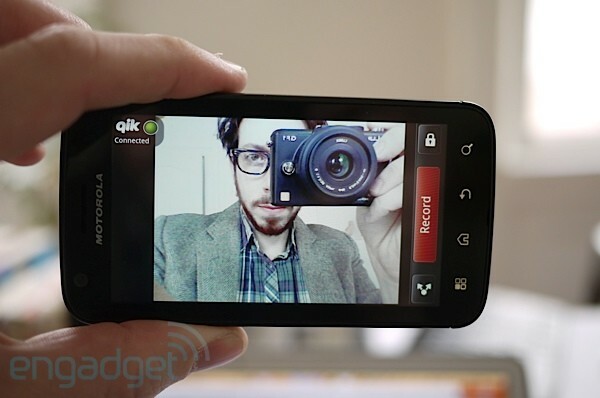 Nothing is dinky about the Atrix 4G, and that extends to the cameras too. The real highlight here is the 5 megapixel shooter on the back of the device, which cranks out impressive shots in both high- and low- light, and can be customized quickly for various settings. The camera also functions as a 720p video camera, and we had great results capturing HD content on the device. Even in low light, the results looked sharp. On the still shot front, we were impressed by the macro capabilities of the camera, but found that some of the images had a purpleish hue that was slightly worrisome. It's not a dealbreaker, but we didn't think that the color quality or saturation was exactly what it could be. As far as video goes, we were impressed with the lack of shake even when walking briskly, though we're disappointed that the device goes into a fixed-focus mode when capturing video (see in action below), which makes it difficult to shoot a variety of subjects at once. There's also a VGA camera on the front of the device. As you'd expect the results with that shooter aren't anything to write home about, but it more than did the trick when using it for video calls (or hair styling). Regardless of some minor complaints, the camera on the back of the Atrix 4G is more than good enough to replace your basic point and shoot, and we'd have zero reservations about leaving the house with only this phone in our pocket. We've come to expect a certainly level of audio quality when it comes to Motorola handsets, and the Atrix does not disappoint. Not only is the earpiece on this phone loud and exceptionally clear, but the speaker on the back delivers crisp, full-bodied audio when listening to music or on a speakerphone call. The Atrix 4G offers variable levels of noise reduction on the earpiece, but we didn't seem to have to tweak anything beyond the "normal" setting for great results. Callers we spoke to said we sounded clear, which is always nice to hear while testing a phone. As far as dropped calls go, we would say that we experienced a handful, though less than what we typically witness on our iPhone 4 on AT&T. The network is far from perfect, but we didn't see an intolerable amount of call issues. If you're expecting Gingerbready goodness here, prepare to be disappointed. Also, if you're craving just the stock Android experience, this is not the phone for you. 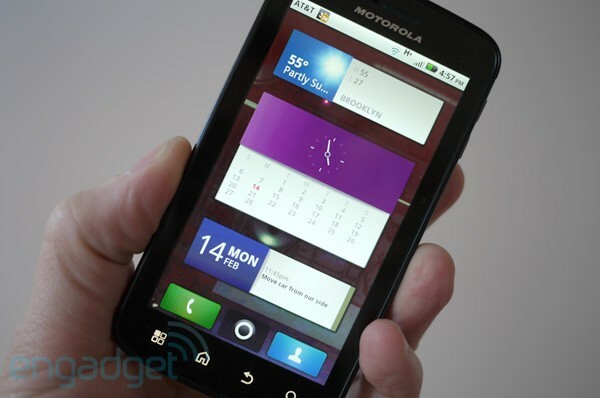 Instead, Motorola is treating customers to its customized Froyo (2.2) build, featuring none other than -- yep -- Motoblur. We thought that Motorola's social-centric skin was going the way of the dinosaur, but it's back in full force with the Atrix 4G. Now, before you get all let down and mopey, we'd like to say that the software side of the Atrix is actually quite good, and there are lots of little improvements the company has made to bring Android together in a bit more of a cohesive manner. It also helps that Google has begun to independently update its core apps (such as Gmail and Maps) outside of system updates, which means you'll get the same experience in many places that you would on an untainted Nexus S running Gingerbread. Since this isn't exactly a new version of the software, we're only going to delve into a few points that we think are notable. For starters, we're a little disappointed by the fact that Motorola and AT&T are loading up the Atrix with a considerable amount of bloatware. Vlingo, a handful of AT&T apps, Blockbuster, and a smattering of other programs all ship on the handset with no option to delete them. Even worse, some of them occasionally throw notifications up bugging the end user to register or use the applications. Adding insult to injury, Motorola (or AT&T, who has a habit of doing this sort of thing) has locked the device down in a way that not only prevents you from flashing the phone with a custom ROM, but also won't even let users install apps via email or SD card. That means that when our developers gave us a new version of the Engadget app to test out, it was a total no-go on this handset. So much for open! Update: Some of the pre-installed apps can be deleted, but not all. On the bright side, there are lots of good pieces to find in this OS, like the inclusion of QuickOffice for dealing with documents and PDFs (which it handled speedily), and some of Moto's own embellishments, such as the ability to use the keypad dialer to find specific names or numbers (which greatly sped up call-making), and the company's Mobile Hotspot feature. The latter was easy as pie to set up, though didn't deliver any mind-blowing downloads speeds in use (more on that in the data section). It should come as no surprise that much of the hubbub over the Atrix 4G is really hubbub over the fact the phone turns itself into a (nearly) complete PC with the addition of one of the docks which Motorola offers. Utilizing a piece of software the company calls Webtop (really an instant-on custom Linux build), you can toss the Atrix into a laptop or desktop dock and fire up a bizarre environment where you're presented a window representative of your phone (it is, in fact, your phone in a window) alongside the Webtop software, which is mostly just an instance of Firefox along with some settings and further integration with phone functionality. We find the use of Firefox somewhat perplexing -- Chrome is Google's browser product, and besides aligning with Android, it's typically a faster browser for even lower-powered system, begging the question of why Motorola opted for the older, slower Firefox. Additionally, Chrome has just begun to offer proper web apps, something that seems perfectly suited to system like the Atrix 4G. 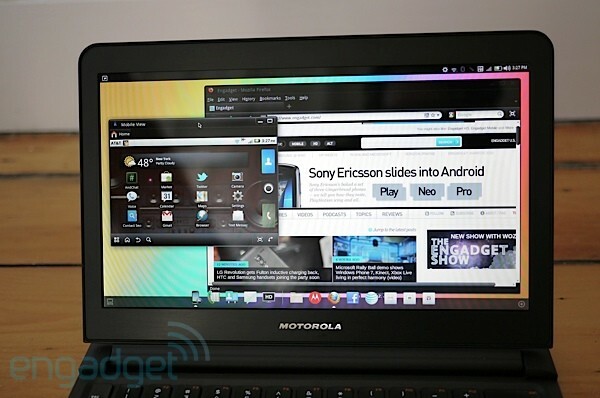 Call us crazy, but why not just boot into the Chrome OS environment? At any rate, while in the environment Motorola does provide, you can make and receive calls and use all of your phone's software while running the browser or standalone web apps in separate windows. If you open an app on the phone, it creates a tab in the phone window. It's hard to fully describe how it works, but it's an unusual combo. Separate phone apps can't be run in their own windows, and while they can be scaled to fit a larger window (or the whole screen), they're simply zoomed in (not reformatted). The Webtop environment provides Growl-like notifications for things like new emails, and also offers a representation of phone notifications along the status bar which can quickly jump you to your notification window on the phone. If you're interested to know what's happening on the Firefox side, you'll be disappointed to discover that the browser is sluggish by most standards, not even coming close to the performance seen on most modern netbooks or cheaper laptops. In place of actual applications, you can create web app shortcuts, but in our experience running even just a couple of separate browser instances can bog down the system to a point of frustration. You can run Flash content in the browser, though performance was choppy at best -- providing a barely watchable experience for something like Hulu at its lowest bitrate setting. If you're hoping to use this for video or audio streaming (even over WiFi), you may find yourself disappointed. 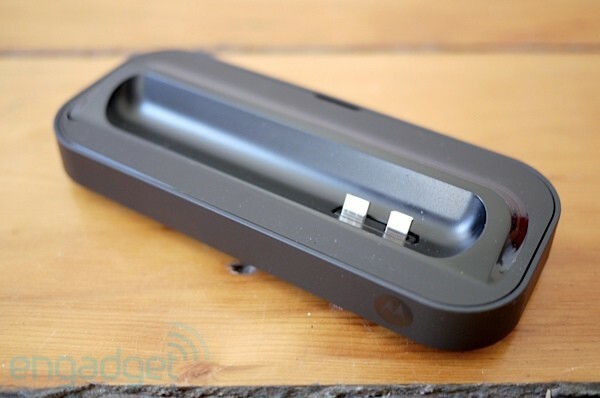 At a glance, Motorola's laptop dock looks like something out of a gadget nerd's fever-dream. A super thin vessel for the Atrix 4G's brain, with styling and build quality that matches the best from Apple and Dell (think MacBook Air and Adamo). The sleek dock is built out of brushed, black metal and soft-touch plastic, is smaller and thinner than almost every netbook or laptop on the market, and weighs just about 2.4 pounds. That metal housing also means that the device is a magnet for fingerprints, so if you get one of these puppies, expect to keep some cleaning supplies handy (or hey, maybe you don't care about that sort of thing). Around back there's a solidly built flip out dock which the phone settles into. When you pop open the laptop, you'll find a healthy 11.5-inch display with a resolution of 1366 x 768, a full width chiclet keyboard which is small though by no means unusable, and a spacious trackpad with two buttons. Around back there are two USB ports and the power jack, and on the front of the laptop there is a small battery display readout which is activated by a small button (similar to a MacBook Pro). The laptop does nothing without a phone plugged in, but once you seat the Atrix 4G, it almost immediately fires up the Webtop OS, which will look pretty familiar if you've ever used Ubuntu. Since the dock is mostly just battery, it does double duty as laptop and charger -- even when not plugged in somewhere, it will recharge your phone's battery while it's being used. Motorola says you can expect about eight to ten hours of battery life from the dock, and those numbers seemed pretty accurate during our testing. It was quite impressive. While the laptop dock is handsomely designed and solidly built, in use it was quite frustrating. Putting aside our complaints about the Webtop environment, the laptop dock creates some pretty major issues of its own. First and foremost is the fact that the trackpad, while spacious, is single touch only, meaning no two finger scrolling (or even single finger scrolling like many PC trackpads). That means that navigation of webpages is a huge hassle as you're forced to manually grab the scroll bar to move through pages. For an environment built around the "web as app" concept, this struck us as incredibly shortsighted. Furthermore, the trackpad buttons are stiff enough that we found ourselves missing presses on a fairly regular basis. Weirdly it's as if Motorola built this dock for use with a mouse -- and in fact, company reps were demoing the setup with a mouse when we picked up our review unit. 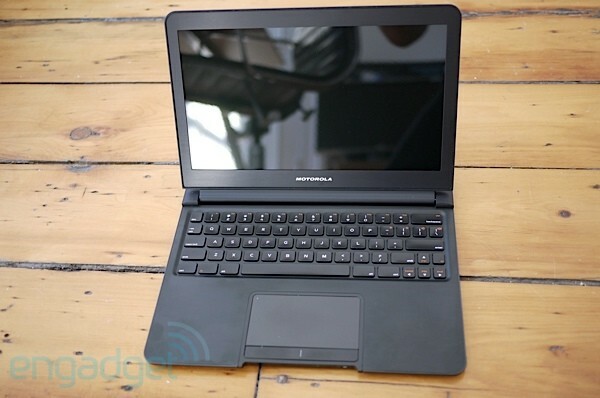 We wanted to love this dock, but at the price Motorola is asking and for the small amount of utility it actually provides, it seems clear to us that your money would be better spent on a tablet or decent netbook. Besides the laptop dock, Motorola is also providing options for desktop and home entertainment setups via its HD dock -- a small slab of black plastic which comes equipped with three USB ports and an HDMI jack around the back. Just like the laptop dock, when the phone is seated in the device it switches modes, and you're able to jump into one of two environments: Webtop or Entertainment Center. As you might guess, the desktop / HD dock doesn't fare much better when it comes to standing in for a computer, though thanks to the pricing here, it's a little more viable of a choice, since you're unlikely to purchase a decent desktop for $129. Then again -- do you need a desktop computer? Because if you do, you'll probably want something a bit more powerful than what the Webtop offers. As a set top box, we have slightly better news to report. Motorola has come up with a really sleek and clean interface through which you can access your video, music, and photos, but the remote which is included to navigate your content seems to be hit or miss. When we had our dock about 5 feet away from where we were seated, the remote was sometimes non-functional when scrolling through menus and making selections, causing us to double and sometimes triple tap to get it to register. Motorola provides an interface on the phone in the dock to control what's happening on screen, but that only makes sense if you have your dock next to where you're sitting, which is likely on the other side of your room (at the very least, you're sitting opposite the TV, which is where you're going to have this plugged in). As far as the software is concerned, we like the sleek, clean interface that Motorola has come up with for getting at your videos, pics, and music, but there were some issues with playback. Notably, we could get some .M4V files to play, while others would not, and the only error we received was vague at best. Most files worked without a hitch, however. In particular, 720p content we'd shot on the phone looked really quite nice on a big screen, and the playback didn't so much as stutter. We're not sure we really see a huge market for this dock, unfortunately. There are much better ways to get your content onto a television screen, and in fact you can simply plug an HDMI cable into the phone and use the same features that the dock provides (sans remote... though using the phone to control the app is actually preferable as far as we're concerned). Motorola isn't really known for producing great peripherals, but we're quite impressed with the keyboard and mouse the company has cranked out here. Both products work wirelessly via Bluetooth, and we had no trouble pairing them with our setup. In particular, we like the mouse because it closely matches the Logitech M555b (a favorite) in size and functionality. The keyboard, meanwhile, is styled somewhere between an Apple wireless keyboard and BlackBerrys of years past -- as in, we're not crazy about the font choice. 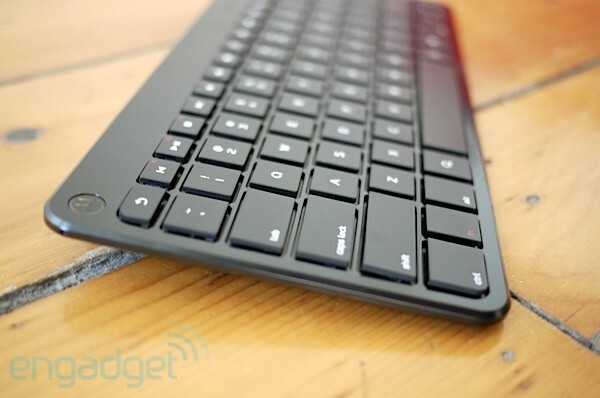 Still, it's a solid, chiclet style keyboard that conserves desk space and has a handful of custom Android keys, which make jumping into specific apps like Gmail or the browser really speedy. We're not sure if you need to shell out the extra cash on these, but they make fine partners to the rest of Moto's offerings. 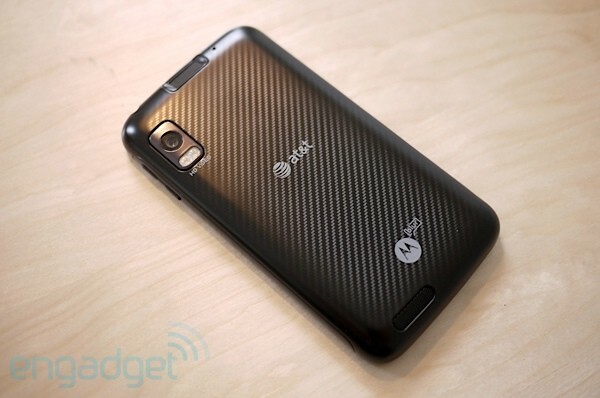 AT&T and Motorola are billing the Atrix as a 4G device. Hell, it's got the term in its name! We wish that we could report back that we saw 4G-like speeds on the phone, but it's actually quite the contrary. In comparison to other handsets we've tested on the network in the same spots, the Atrix 4G actually got lower speed rankings on both downstream and upstream tests. In general, we saw an average download speed of around 1.5 Mbps, while uploads were even worse at just about 0.15 Mbps. We did see download speeds spike occasionally into 2.2 Mbps territory, but that wasn't the norm. 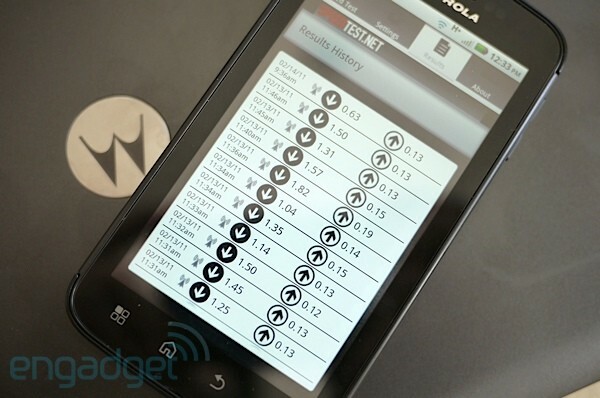 During the testing, the phone had four or five bars, and was clearly displaying the HSPA+ icon. The odd thing is that if you compare the device against the iPhone 4 on AT&T's network -- tested in exactly the same locations -- you see much different results. On the iPhone, data speeds were consistently in the 2 or 3 Mbps range for downloads, and hovering around 1 Mbps for uploads. We're not sure what the issue is with data, but we're not seeing anything resembling 4G on these tests. If AT&T was hoping to impress with its speeds on the HSPA+ network, it still has a lot of work to do. This is where the rubber really hits the road on these devices. 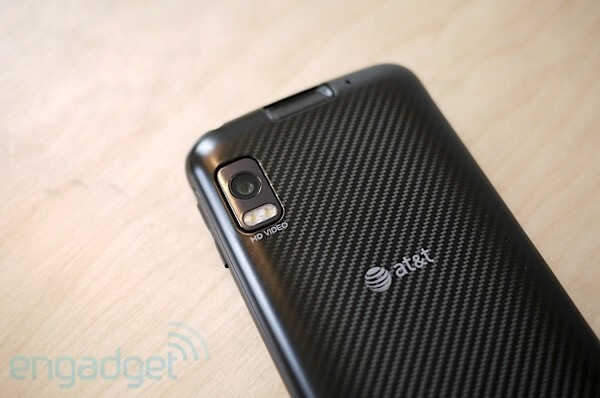 The Atrix 4G by itself will run you $199.99 with a 2 year contract. The laptop dock by itself is a whopping $499.99 (less a $100 mail-in rebate and $100 instant rebate, bringing it down to $299.99). You can get the HD / desktop dock by itself for $129.99, or the bundle (with keyboard and mouse) for $189.99. Simply put, to leave an AT&T store (or its website) with just the phone and the laptop dock, you're dropping $653 and then waiting for that $100 back in the mail. Now that's a lot of cash for a phone and what amounts to half of a laptop -- even if you can impress friends with it. And don't forget, AT&T insists that you have a tethering data plan, which will run you $45 a month -- and that's a tethering plan you could be using with your phone's hotspot feature and any other device you want... like a netbook. In all, it's not a great value if you're springing for the laptop dock, the desktop dock, and some accessories -- in fact, it's not any kind of value at all. The bigger question you have to ask yourself is whether or not you should spring for the accessories, and our answer to that is closer to something like "probably not." We want to love the HD dock and the laptop dock (the laptop dock especially! ), but it's hard to warm up to these devices when they don't really deliver on the experience you're paying for. Our advice? Skip the laptop dock and get a good netbook (there are tons of options) and spring for the tethering plan so you can use the "4G" you're paying for (check your area for coverage, of course). If you absolutely need your phone to pull double duty as an entertainment dock, just get a long HDMI cable -- you, and your wallet, will thank us later.